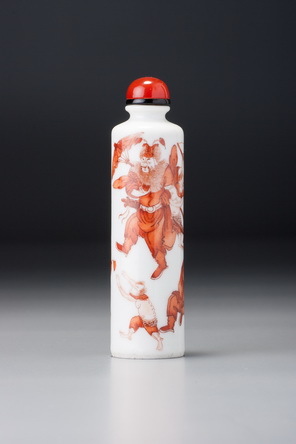 This is one of a series of Imperial bottles that we believe were probably produced during the Qianlong era, possibly beginning quite early in the reign. Usually of this substantial size, they have wide mouths and are made from a range of colourless glass mixed with just enough ruby-red (derived from colloidal gold) to render the material completely transparent while lending it a ruby blush. An almost identical bottle is to be found in the J & J Collection (Moss, Graham, and Tsang 1993, no. 355, where we cite many others and discuss the group, although we have revised our dating a little since then). The same design is also found in other colours including yellow, which reinforces the Imperial attribution (the Smith Collection, in the Field Museum, Chicago, JICSBS, June1972,p. 15, fig. 1), as does extensive use of rope borders, a known feature of palace decoration during the eighteenth century. We noted in relation to the J & J example that only six of the Eight Buddhist Emblems, symbols of a generally auspicious nature, were depicted on the narrow sides, because only six panels remained for decoration given that the foot and neck took up one panel each. The missing symbols—the pair of fish and the lotus—were cleverly represented by the subjects on the main-side panels. This series of bottles was obviously made from the same original design, and many may have been blown into the same mould, although all surface decoration is added by the lapidary, evidence of which is supplied by differences in the carving. It seems likely that once the design was approved, an order was placed for a quantity that, since so many have survived from the eighteenth century, must have been substantial. The ruby-blush glass is so distinctive and so similar across the pink examples (despite differences in the variegation between pink and colourless glass, and varying intensities of the pinks themselves) that they may have been the result of a single, artistic impulse rather than a standard repeated over a long period. 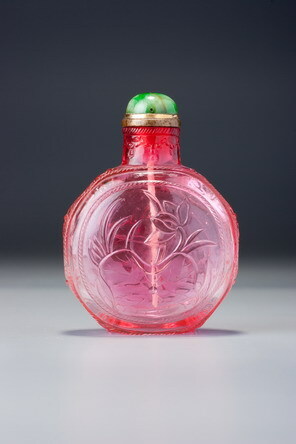 They remain one of the loveliest groups of Imperial, faceted glass bottles and are uniformly impressive, with excellent formal integrity and superb carving. Doubtless, they were originally endowed with a lovely surface polish, both inside and out, which is characteristic of most of the surviving examples.